Inter-satellite laser links (source)I hope each of these companies has someone in charge of thinking about what might go wrong with a single, satellite-based network providing fast, low-cost links anywhere on the global Internet. OneWeb, SpaceX, Telesat and Leosat all aspire to be global Internet service providers using constellations of low-Earth orbit (LEO) satellites. Their success will require still-unproven technological innovation, but there are also political stumbling blocks. OneWeb has already encountered significant political problems in Russia. Russia launched OneWeb's first test satellites and has a billion dollar contract for 20 additional launches, but Russian security officials are lobbying against OneWeb's offering service (see posts from Dec 27 & Oct 27, 2018) on the grounds that it might facilitate spying. When Anatoly Zak, an expert on the Soviet space program, investigated that claim, he concluded that "With the launch of the OneWeb constellation, the Russian rocket industry stands to earn millions, but the Kremlin is terrified at the prospect of unhindered access to the Internet by its citizens." As far as I know, OneWeb is still planning to offer service in Russia, but they have had to make financial and technical concessions. 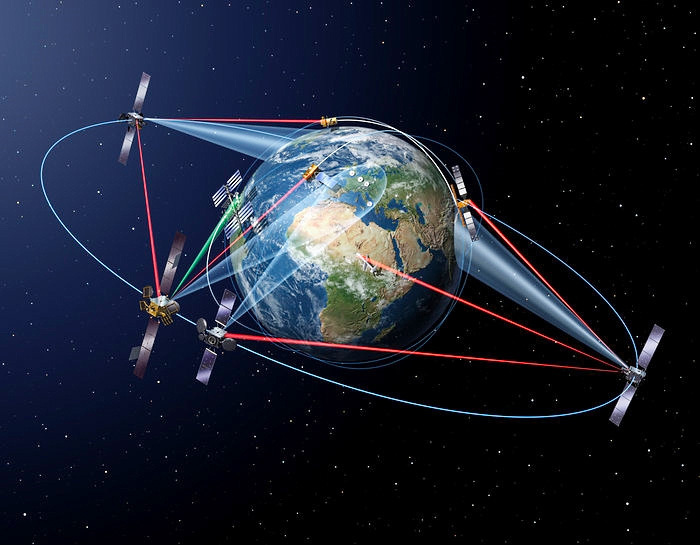 They agreed to become a minority partner in the company that will market their service in Russia and, significantly, they agreed to drop the inter-satellite laser links (ISLLs) from their constellation and pass all Russian traffic through ground stations in Russia. Dropping ISLLs, which are still unproven for this application, will simplify the design of their satellites and save development time and cost. It will also reduce satellite complexity, size, and weight and save power, but there will be costs. OneWeb throughput simulation (source)They will need more ground stations if they offer global service without ISSLLs. OneWeb founder Greg Wyler says they will have more than 40 such gateways, each capable of "seeing" satellites up to 4,000 kilometers away. 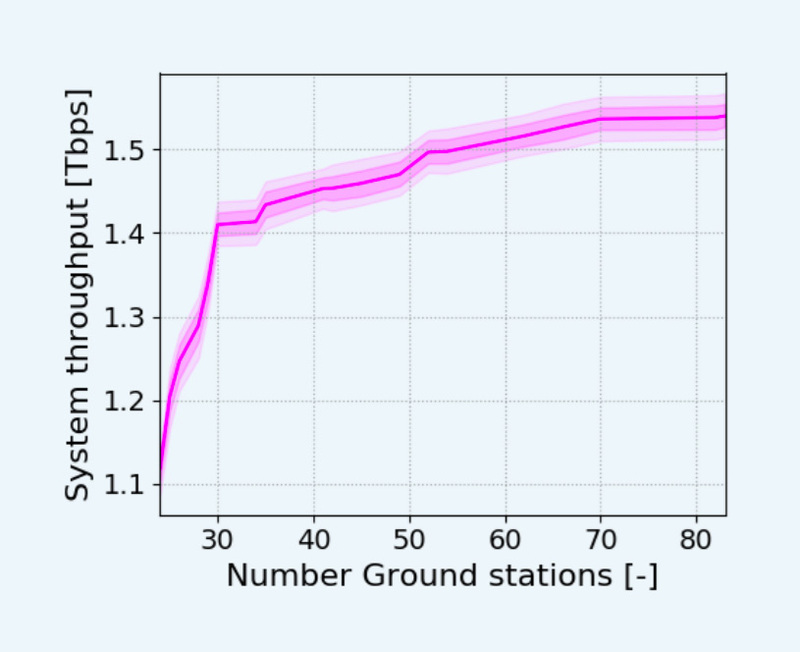 A team of MIT researchers ran a simulation of a 720-satellite OnWeb constellation and they estimate that 71 ground stations would be required to reach maximum throughput. (Anatoly Zak estimates that four to six gateways will be in Russia and speculates that hackers may be able to illegally connect to satellites in neighboring countries). Dropping ISLLs will also add latency, especially on long-distance links. What about the other would-be global LEO projects? Telesat will retain ISSLs, but accommodate countries on a country-by-country basis. Erwin Hudson, vice president of Telesat LEO, says we "have the flexibility in our network control system to route traffic all kinds of different ways. There are no rules that traffic has to go over the inter-satellite links." SpaceX is going forward with ISSLs, and they are also aware of the political problems. During a recruiting talk at the opening of their Seattle satellite-design office four years ago, CEO Elon Musk said "I'm hopeful that we can structure agreements with various countries to allow communication but it is a country-by-country basis ... it's not gonna take longer than five years to do that and not all countries will agree at first ... that's fine." Leosat is also prepared to build gateways to make accommodations. For example, CEO Mark Rigolle says they would be willing to build a gateway in China to accommodate the government; however, that would be inconsistent with their primary marketing focus of providing low-latency, secure, point-to-point links globally. These companies are all thinking about concessions they need to make in order to operate in countries that want to surveil citizens and control their access to information, but what about guarding against aggression? I hope each of these companies has someone in charge of thinking about what might go wrong with a single, satellite-based network providing fast, low-cost links anywhere on the global Internet. During the recruiting talk mentioned above, Elon Musk said "[the constellation design] is a really difficult technical problem to solve so that's why we need the smartest engineering talent around the world to solve the problem and, you know, to also make sure we don't create Skynet." At that time, I asked "Would global Internet service providers require unique regulation and, if so, what should it be and who has the power to do it?" and said I was "less worried about Musk creating SkyNet than creating Comcast on Steroids," but I was naive. Follow these links for background on the four projects: SpaceX, OneWeb, Telesat and Leosat. Local Time: Tuesday, April 23, 2019 07:04 AM PDT – Page Load: 0.3547 Sec.